An unusual coalition of fossil fuel interests, environmentalists and free-market adherents has criticized a proposal from U.S. Energy Secretary Rick Perry that would prop up coal and nuclear plants across the country. And some of those familiar with Texas politics are wondering if the Perry that served as governor for 14 years would have opposed the plan, too. But to some, his views have shifted since he became President Donald Trump's Energy Secretary in March. “We subsidize a lot of different energy sources. We subsidize wind energy, we subsidize ethanol, we subsidize solar, we subsidize oil and gas,” Perry said at the hearing. "Government’s picking winners and losers every day,” he said later. Lawmakers on the committee were quick to point to the disparity between Perry's current position and those during his tenure leading Texas. "It seems like with your new effort you are gaming the system and not doing what we did when you were governor in Texas,” U.S. Rep. Gene Green, D-Houston, said at one point. U.S. Rep. Pete Olson, R-Sugar Land, warned Perry that he was creating the impression that "you prefer government control over the free markets." Perry's proposal says generators that can store 90 days’ worth of fuel onsite — like coal and nuclear plants — should be shored up because they can keep the electric grid running in the event of a disturbance. Perry “clearly is acting based on what his boss, Trump, would like him to do,” said Lenae Shirley, a senior director at the Environmental Defense Fund. “When institutes that represent the Koch brothers are aligning with environmentalists on this, that sends a pretty strong message that this is not the right move." 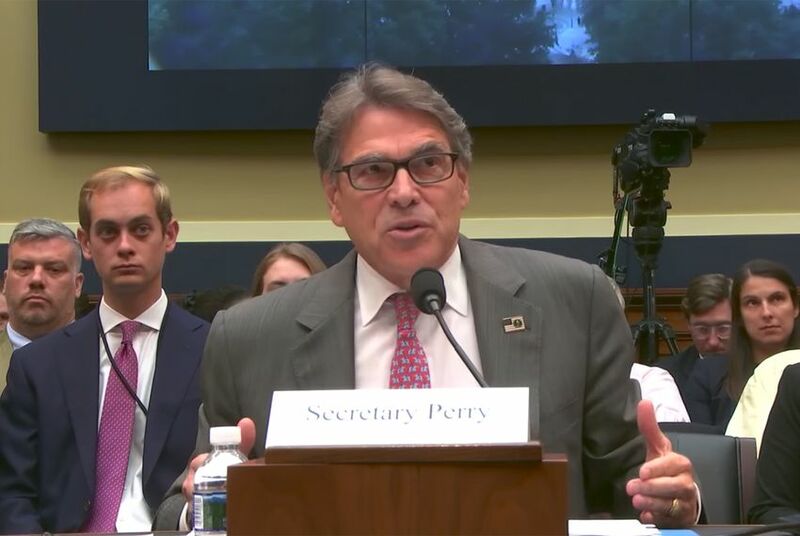 At last week's hearing, Perry said he’s committed to an “all-of-the-above” energy strategy — and pointed to his “real track record” as governor. “But the wind doesn't always blow,” he added. “The sun doesn't always shine. The gas pipelines, they can't guarantee every day that that supply is going to be there." That report, which had been highly anticipated by both members of the energy industry and environmentalists, noted 531 “coal generating units” closed across the country between 2002 and 2016 and laid most of the blame for those closures on the “advantaged economics of natural gas-fired generation” — with regulations and rising output from wind and solar energy as lesser factors. The study's authors did not find that such closures had made the grid unreliable. “If we go back in time, I'm sure we could find a dozen quotes from Gov. Perry very excited about these kinds of developments,” said Chrissy Mann, a senior representative of the Sierra Club’s Beyond Coal campaign. While Perry long touted free-market principles as governor, he also championed spending millions in tax subsidies for firms relocating or expanding in Texas, programs critics derided as “corporate welfare.” And as governor, he did push for the permitting of new coal plants while other states were scaling back amid pollution concerns. Marquez said Perry's proposal is a responsible and reasonable way to approach issues with the grid — and that he's consistently advocated for a diversified energy portfolio. Anybody surprised by his plan "hasn't been paying attention," she said. "He sent it over to FERC so that there can be a transparent dialogue, an open dialogue about it," she said. But even if FERC adopts Perry's plan as is, it would largely not impact nuclear or coal-powered plants in Texas. According to ERCOT data, coal made up 22 percent of the state’s generation capacity last year. But the coming closure of several coal-powered plants in the state has set the stage for wind to overtake coal in Texas' overall energy mix in 2018, according to Joshua Rhodes, a research fellow at the University of Texas at Austin’s Energy Institute. If ERCOT determines the plants aren’t needed to keep the state's energy grid reliable, their retirements could prompt the elimination of more than 800 jobs. Disclosure: The Environmental Defense Fund, NRG Energy, Vistra Energy and the Texas Public Policy Foundation have been financial supporters of The Texas Tribune. A complete list of Tribune donors and sponsors can be viewed here.